Buhler Mennonite Brethren Church at 415 North West Street, Buhler, Reno County, Kansas, started as a Sunday school in about 1901 and began to conduct church services in a grade school building in 1904. In 1908 the first frame church was erected. 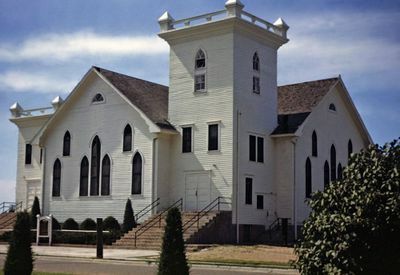 Under the services of Elder Henry Adrian this church became an independent body, working, however, in close relationship with its mother church, the nearby Ebenezer Mennonite Brethren Church. In 1921 the Ebenezer Mennonite Brethren Church transferred to Buhler as a body, and built the present frame structure, 60 x 56 ft, in 1923. In 1926 the Mennonite Brethren Church of Inman, Kansas, joined the Buhler congregation. The 1951 membership of 512 had Sunday school, Sunday morning and evening worship, a midweek service, as well as a young people's organization, sewing circles, men's organization, and three choirs. Other ministers who served this church through 1951 were P. R. Lange, J. B. Toews, C. E. Fast, H. P. Wiebe, J. E. Hildebrandt, Ervin Adrian, and Jacob J. Toews. Toews, Jacob J. "Buhler Mennonite Brethren Church (Buhler, Kansas, USA)." Global Anabaptist Mennonite Encyclopedia Online. 1953. Web. 21 Apr 2019. http://gameo.org/index.php?title=Buhler_Mennonite_Brethren_Church_(Buhler,_Kansas,_USA)&oldid=140608. Toews, Jacob J. (1953). Buhler Mennonite Brethren Church (Buhler, Kansas, USA). Global Anabaptist Mennonite Encyclopedia Online. Retrieved 21 April 2019, from http://gameo.org/index.php?title=Buhler_Mennonite_Brethren_Church_(Buhler,_Kansas,_USA)&oldid=140608.